If you consider yourself a scented candle fan, and you don’t know the story of Rigaud, then do I have a little candle history for you! Rigaud has been around for quite a while, since 1852 when Jean-Baptiste came to Paris to collaborate with the laboratories Grimault & Cie, who were famous for their aromatic products. Jean-Baptiste made soon made his way into the world of perfumery and “hit upon the idea that introducing a new aromatic plant would be like adding a new note to my keyboard, as it were, and that only on that condition would I be able to create new products bearing the stamp of originality.” His first major innovation was his essence of Ylang-Ylang followed by the Kanaga flower of Japan. He eventually became the official perfume supplier to Her Majesty the Queen of the Netherlands, then to the royal family of Greece, and finally perfumer-distiller to the Russian Imperial Court. This however is where the story becomes very interesting for us candle lovers. “Eventually Henri Rigaud’s son Mario, the grandson of Jean-Baptiste, took over the company and in the 1960s, his wife Viviane turned the boutique into a veritable private salon, like a boudoir where a great lady receives her peers. A lover of homes and interior decoration, blessed with unerring taste, Viviane Rigaud was also an innovator. With her husband, she was the creator of the first scented candle. Mario Rigaud developed and patented an innovative wax formula. This was an original formula for a soft wax whose main characteristic was that it perfectly revealed the natural ingredients that make up the Rigaud perfumes and allowed them to be faithfully transmitted. And that is how the Cyprès candle was born – dark green in color, presented in a container of hand-blown glass, tied with a red ribbon and with a silvered metal snuffer cap. It was the 1960s, and the Rigaud Cyprès candle was an international success. 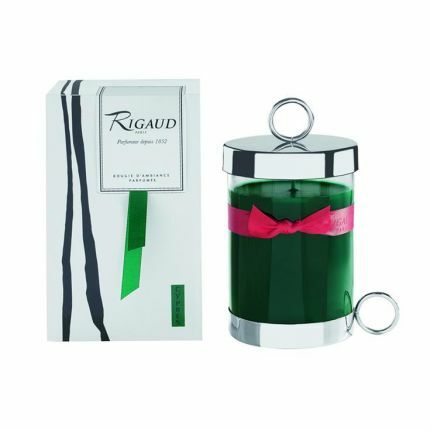 The scent of the Rigaud candle soon became the height of chic in well-appointed homes, and even in the White House when Jacqueline Kennedy was its mistress.” Read More Here History of Riguad Perfumes. A perfect gift for the candle aficionado in your life or even better yet, a gift for yourself!